At the end of the 90's, [Sta:Win] wanted a new bus fleet. Low floor, wide doors, fuel efficient. With this step from high floor busses to low floor busses, the executives also wanted a new look for the fleet. The old light gray and white-orange was a bit outdated. So the designers went to work and started with brighten the colours, giving them more contrast. The colours were switched so the bus was almost fully orange. This makes them so recognisable from far away. And to break the big, orange polygon on the sides for a bit, the iconic dot's were born. To make this new style familiar to the public, the old O407 busses were already repainted to this new style. The 10 Express busses were painted in an "Alt wird Neu" advert campaign to let the public know that the bus company didn't change. These busses are ofcourse replaced with the Metrobusses a few years later. 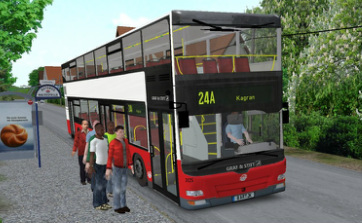 So that is the story that made the O407 fit in this repaint pack. Included in version 4.0 are four different versions. 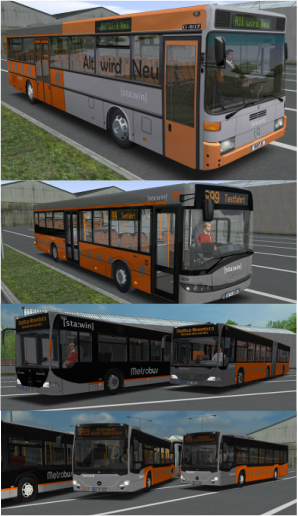 Two old style repaints, one "Alt wird Neu" repaint and one modern repaint. This can be extended in the future. Oh, and there is also a bonus included in this update. You will find out what in the changelog :). Bronsmeer 2.0 |1.2.5| Now omsi 2 compatible! Finally! after more than 18 months of work, Bronsmeer 2.0 is ready for release. The latest patch makes the map compatible for omsi 2. Bronsmeer is a fictive city in the Netherlands. It's quiet, old and has some challenging roads for you to explorer. Your job is to transport the passengers under the flag of the arriva transport group. 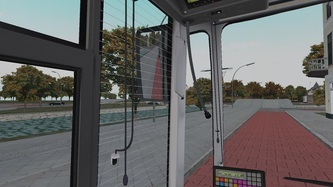 You're driving with modern citaro busses and a tight, but yet workable schedule. There are 5 buslines for you to explorer. Busline's 11 and 12 serve the city of Bronsmeer and the smaller village Droosden in a 30 minute frequency. These lines are short but coupled to each other. Together with busline 124, line 11 makes a 4 times a hour frequency with the historic city centre of Bronsmeer. A popular place for tourists to visit. Busline 125 is coupled to lines 11 and 12 (except on sundays). This line is driving with the same frequency as lines 11 and 12. 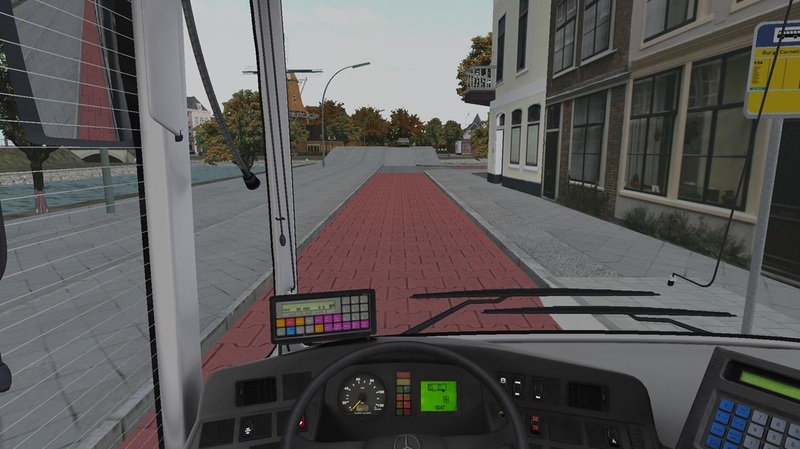 The busline serves Droosden, Overhuizen, heeringerpoort (industrial area), heeringen, AZC heeringen (a busy stop) and veerdal. This line takes you to area's that aren't covered by other buslines. It's a diverse route with some challenges. The route is a 25 minute drive. Busline 128 connects IJsseldam and Veerdal with Liswoudde. The route is one of the easier but still a challenging one. With a tight schedule you have little room for error. The line also serves Flora Holland. The famous dutch flower auction. Unlike the other lines, this busline doesn't start and end at a bus or train station. So don't you worry that you are not at the right stop. This line also has a length of 25 minutes. Busline 124 is the longest busline of them all. It's the main line of Bronsmeer, most of the other lines connect to this line. In the rush hour, this line drives in a 30 minute frequency. In the late evening and in the weekend it has a 1 time a hour frequency. But because it is adapted to the other lines, we were still able to get a good coverage throughout Bronsmeer. This busline serves Heeringen, Overhuizen, Bronsmeer, Ijsseldam, Heimeer, Liswoudde and Zuiderwaard. The route takes 50 minutes to complete. Busline 342 is an R-net line. R-net is an high quality transport service that uses busses in a standard livery used by all bus companies, high frequency lines and a fast, direct line that only stops at a few bus stops. Busline 342 has an length of 25 minutes and goes from Heeringen via Ijsseldam and Liswoudde to Zuiderwaard. The route isn't very challenging but still not easy. The bus waits for 3 minutes at Ijsseldam busstation to insure the connection to other lines. From monday till saturday this line has a 2x a hour frequency, in evenings and on sundays it has a 1x a hour frequency. This line uses articulated busses. I hope for your feedback and improvement points. Please read before use the read-me. This contains many important information about the dutch traffic rules, ibis system etc. Have fun with the map! 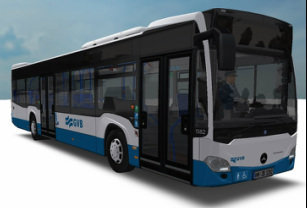 Someone asked me to make a GVB repaint for the new Citaro C2. With the new update of that bus there also is a solo version available. So why not also make the repaint for the solo bus? It's the first community repaint for the solo bus, there are still some issues with it. Two area's on top of the headlights can't be repainted for some strange reason. But they are white so that isn't a big deal for this repaint. There is a fix for it! You can find it at the bottom of this post.. The repaint for the articulated bus doesn't has this problem. This repaint also includes the original mercedes logo's. But this can interfere with other logo mods (I haven't tested it). The interior has a wooden floor because I personally like it more than a normal floor. The repaint is fictional because GVB doesn't has these busses in service. Have fun with it! 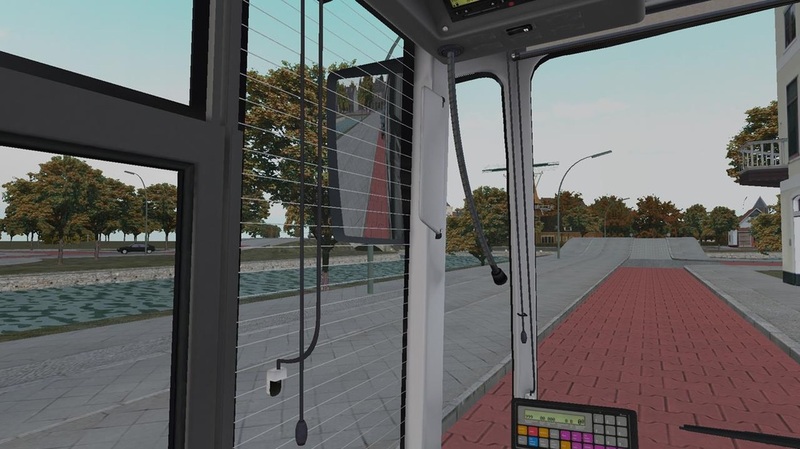 Even though BVG doesn't have any Citaro C2 busses in service at the moment, I decided to make a repaint for it. 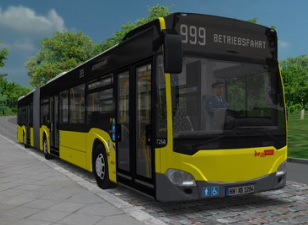 It's based on the new BVG style (Like the VDL Citea busses). The repaint includes in- and exterior. Have fun! This is an repaint of OV Regio Ijsselmond. This is an sister company of connexxion. 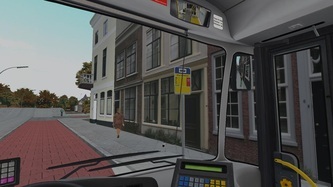 Since 2014 they drive buslines in Flevoland (NL) and East Overijssel (NL). The style of the bus is decided by the goverment of these two area's and is the same as syntus in Overijssel. 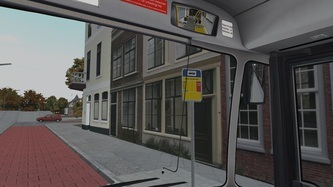 On the entry side of the bus are common things of Flevoland and on the driver side are common things of Overijssel. 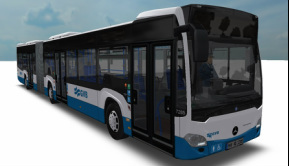 The citaro isn't used by the company but there were plans for it. 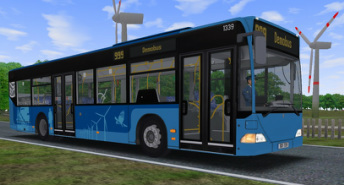 In real live this livery can been seen on busses from the following types: Volvo 8700 RLE, Iveco Crossway le and VDL Vitea XLE. The repaint is originally for the 2 doors version but edited for the 3 doors version also. 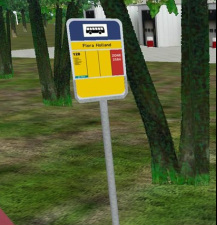 Because Bronsmeer 2.0 still doesn't work in omsi 2 and many people can't wait for this object, I release the Dutch busstop sign. This sign is very common in The Netherlands and used by almost all bus company's. Please read before use the Read-me. Here you can find instructions for use of this object. A bit of modding experience is required. Hi all, after a long time without repaints, I've something for you. Connexxion is one of the largest public transport company of The Netherlands using many different names for their services. I've created a pack with 4 versions that connexxion uses. A normal green one, a green maxx city bus version, a gray version and a red twents version. The interior isn't 100% the same as reality but I can't use the original texture due to the uv mapping of the seats in the bus. I've replaced the seats with a texture that is common for modern connexxion busses. Have fun! One of the few things that I didn't liked about the new Mercedes-Benz Cito O520 are the mirrors. So first thing I did was change it. After some testing I found the right combinations. The front, left mirror and right mirror view are changed so they are a bit higher and the right mirror view is also a bit zoomed in so you can see the mirrors a bit better. The mirrors it self are all changed. The left mirror now is more facing down so you can see your front tire. The right mirror is also a bit faced down so you can see if you are nice lined up to the station. It is also a bit zoomed in. The interior mirror is also a bit zoomed in and a bit changed to fit the new higher view positions. I hope this helps you guys to enjoy this bus more, because it is a nice piece of work. Of course thanks to alterr and his team for this great bus! I was browsing the web and saw a picture of a MAN Lion's city DD with wien layout. So there wasn't any MAN logo but a Gräf & Stift logo with the emblem of man. So I've made a repaint of it for omsi. As you can see. The grille now misses the MAN text logo and on the side's and under the front windshield is now a Gräf & stift logo. I couldn't find any other picture so the logo can be wrong. As interior I've made the seats like the ones of the "normal" MAN Lion's city's of Wien. Have fun with it! Welcome in the download center! Here you find a growing number of mods for omsi. Most of the files are stored at our server so you don't need to sign up to download our files. Our server provides a good download speed and direct links. So... no ads and no waiting time. When downloading a file you automatically agree with the licence agreement. 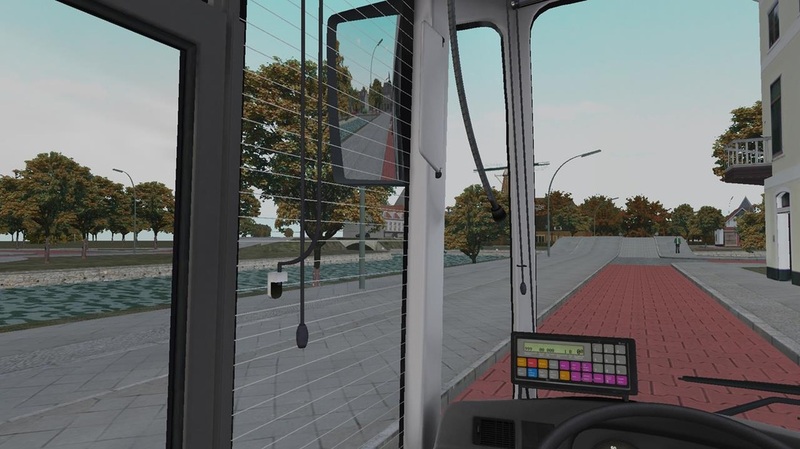 Licence information is always located in the folder of the repaint images (All my repaints are located in a separated folder inside the repaint folder of the bus. The author information is located there). As we want to be, as you wanna see. We're fully ad-free!